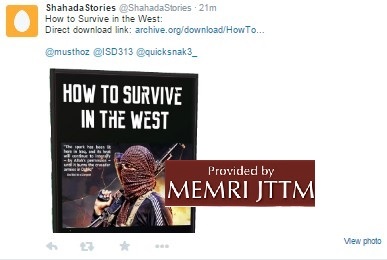 On March 19, 2015 the Twitter account @Shahadastories distributed a link to an e-book titled "How to Survive in the West: A Mujahid Guide." 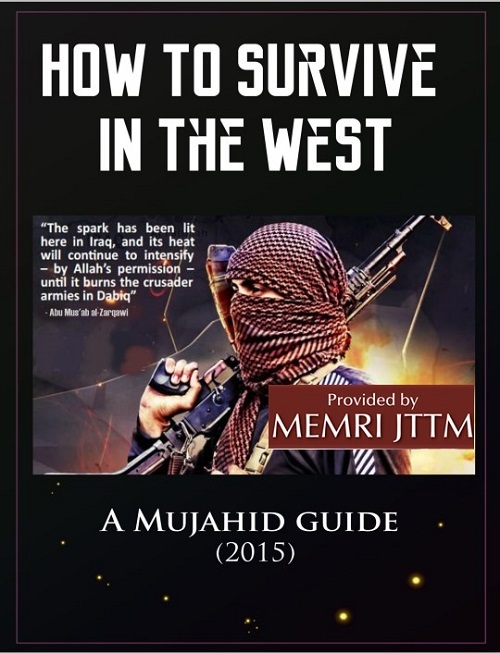 This is the latest in a series of e-books compiled by supporters of and recruiters for the Islamic State (ISIS), that provide practical guidance to young Muslims in the West who wish to join ISIS or to wage jihad in their countries. This e-book's chapter titles include: "Hiding the Extremist Identity," "Earning Money," "Internet Privacy," "Training," "Bomb-Making," "Transporting Weapons," and "What Happens When You Are Spied On And Get Raided." Chapter 1: "Hiding The Extremist Identity"
Chapter 1 provides various instructions for both converts to Islam and for those born into the faith. To the former, the guide notes: "By not showing you're Muslim, you've already excluded yourself being in the 'Terrorist watchlist.'" The latter group is cautioned: "Don't make it too obvious you have become a practicing Muslim. For example: If you haven't grown a beard, don't grow it now, because you will bring unwanted attention onto yourself. Mujahideen in Muslim lands remove their beards for deceptive purposes." In addition, "Practicing Muslims" are instructed "not remove their beard if they already have one. This would only draw unwanted attention to yourself from friends and family, and this will in turn lead them to spy on you." The e-book recommends to women: "If you wear a hijab and go to a place where Muslims are searched (i.e. airports) then do not wear a black hijab, but a colored one instead. Muslim women who wear black hijabs are searched more in airports than those wearing other colored hijabs. This is merely due to a stereotype of fully black-clothed Muslim women being stricter in their religion." The e-book suggests that extremists should disguise themselves and alter their appearance to resemble non-Muslims in the West. In addition, they should change their first name or their nickname. "When a Muslim goes out in public, he wants to fit into society to make himself look as normal as possible. Remember this isn't because he fears his Islamic identity, but he is doing this so he is not suspected of being an outsider enemy." It is also reccommended that Muslims in the West change their behavior and go out of their way to appear more friendly: "Making yourself look more friendly and open minded to the Western public – For example: Muslims who call themselves by a Western nickname gain more acceptances by their non-Muslim colleagues." According to this chapter, having a Western name carries additional advantages: "People with Islamic names get less jobs than those with Islamic names. This alias might be important if you need an important position in a specific job, i.e. Mujahideen send people to work in power plants or enemy governmental positions to spy on and leak reports to the Islamic State leadership (as double agents)." The book even suggests that agents change their voices, for example, when speaking anonymously to others they should put a cloth over the telephone receiver, or use a different tone or accent. Chapter 3: "Easy Money Ideas"
This chapter lists ways in which people in the West can steal money to finance terror operations. "If you are an expert in credit card fraud, Paypal/Ebay scams, phishing, [or] hacking, or you know the secret of a big company, then take advantage of your skills. If you can claim extra benefits from a government, then do so. If you can avoid paying taxes, then do so. There is a report that a Muslim accountant 'took' $50 million from his boss and fled to the Islamic State. Other Muslims 'borrowed' a loan as maximum as they could and used it to emigrate to the Islamic State. Another Muslim hacked some Israeli credit cards and used the money to go to the Islamic State." Phishing is another means suggeasted by the e-book to acquire funds; however, the book specifies: "Attacks should be focused and prioritized on those who insult Islam and the Muslims most of all. They are the real enemies." This section is broken down into two types of Internet privacy. The first deals with having a clean home IP address. It explains, "When you browse the Internet, you want your Internet activity to look as normal as possible. You do not type anything jihadi, and possibly not even Islamic on your searches, and especially not in your computer." The second type involves jihad searches on TOR. The chapter states: "The safest way to get a basic overview on Jihad is to watch the news channels (such as Al-Jazeera). They do not tell the clear picture, but at least you get an overview of what is going on. This is safe because these channels are broadcasted on Satellite for free, and no one can do a search on your history." The e-book explains that physical training is a vital part of getting in shape for jihad. It should be noted that portions from this section were previously printed in e-book “The Islamic State.” However, the tips and advice are more detailed in this version. "Mujahideen go through a range of training to build up their stamina [and] strength, and to gain new skills. Going to the gym and running in the park is considered normal in the West. However, wearing army clothes, a backpack, and weights does look abnormal. You have to train like a normal person. You cannot look different. So men may wear a t-shirt and ¾ jogging trousers whereas sisters may go to the gym [during] female only sessions or run on a treadmill at home to build up stamina." The book claims that "Mujahideen run for a few hours, daily on mountains before having their breakfast," and adds, "In urban warfare, people need to run outside and inside of buildings. So running up and down the stairs is a really good exercise. Learning how to climb walls, and get off walls is also important. (Search wikihow.com on the perfect ways to jump)." The chapter also encourages readers to study krav maga and to take up martial arts, and stresses the importance of honing shooting skills and of target practice. It recommends the use of Nerf guns and paintball guns for practice, and also recommends that would-be jihadis use video games such as Call of Duty to familiarize themselves with movement through urban terrain. Chapter 6: "The Survival Kit"
The section titled "Survival Kit" details essential items that, it says, should be transported in a "cigarette tin." The tin, it says, should contain "Matches, Candle, Flint, magnifying glass, needles, small fish hooks, beta light (a small light which lasts for 15 yrs- it is good for reading maps in the dark,) snare wire, flexible saw, medical kit, surgical blades, waterproof plasters, water purifying tablets, condoms (they can hold 1 litre of water), compass, cotton wool." Chapter 8 provides lengthy instructions on how to construct a homemade bomb. It explains that while Al-Qaeda in the Arabian Peninsula (AQAP) taught its readers how to make three different types of bombs, whereas this chapter "will focus on six different types: Molotov cocktail, nail bomb, microwave airbag bomb, gas canister bomb, remote controlled bomb, and car bomb." The book explains that the microwave airbag bomb was used by the Tsarnaev brothers in their attack on the Boston marathon, and that their bag contained: "A mini microwave oven, car airbags (containing sodium Azide) or Aerosol, [Propane] spray cans placed in the oven, nails/sharp rocks/metal balls(=shrapnel) put in the microwave oven, and a timer. They put the timer on to when they wanted the oven switched on. When the microwave was on, it would heat up the airbags or aerosol cans. The airbags or aerosol cans would explode due to intensity in heat and pressure, forcing the microwave door to open forcefully. The nails/sharp rocks etc in the microwave would come flying out of the microwave in the direction of the target." 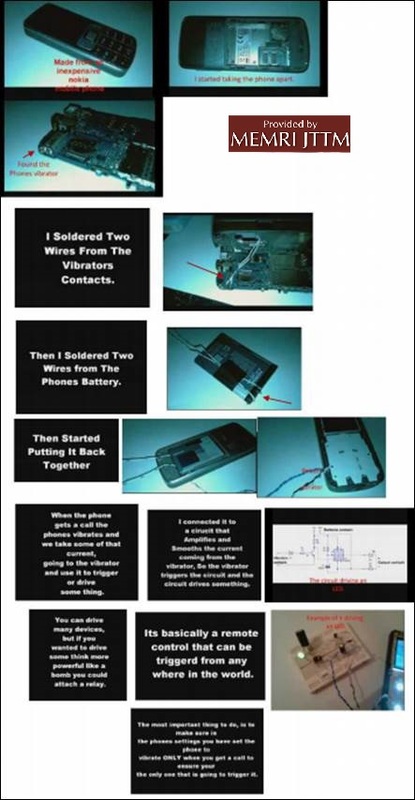 The book also provides a tutorial on mobile phone detonators, including a link to an instructional video on YouTube: "The principle in this is simple: buy two cheap cell phones, wire one up to explosives (like leaking gas in a fully closed car) and use the other as a detonator by simply ringing the phone wired to the explosives. The mujahideen use this technique all around the world. It keeps you safe because you can be far away when activating the device, and it is easy to make!" The e-book's ninth chapter concerns transporting weapons. It states: "After buying weapons, transporting the weapons and huge sums of cash/jewelry from one location to another in the boot of the car can be dangerous and will give you a long term jail sentence. You could be jailed for smuggling, laundering and dealing in arms. The best method gangs have used throughout the world is to take your car to a garage, and make hidden compartments within the bodywork of the car. These hidden holes are usually made within the car body's interior, since security services and border guards simply do not have enough time or equipment to search all cars for hidden compartments. Gangs place bags of money, drugs, and weapons within these hidden compartments. They then ask the lower ranked "transporters' in their gangs to deliver and transport this car from one country or city to another without fear of being detected." Chapter 10: "What Happens When You Are Spied On And Get Raided"
"If the intelligence agencies or police has some suspicion that you are doing some criminal activity, you will be spied on and your house could be raided. The raid will begin within the later parts of the night (after 4 am) or in the early morning (usually before or during the Fajr prayer time). The reason why it is done at this time is to scare you and catch you unprepared because most people are asleep during this time period. Days before the raid, you may be being watched by the intelligence agencies because they want to know your habits. The best way to know if you are being followed is by doing the 'circular route' method. All secret agents do this and it becomes a mandatory security habit whereby you will do a full circle route before you go anywhere important. "The circular route method: You will set off from point A and travel to different places while looking from the corner of our eye to see if you are seeing any same person following you everywhere you go. If you see someone going every place you go, you will finally reach point A again. This is a fully circular route because you have gone back to your original point. Now if you set off again to where you need to go, look from the corner of your eye again. Is that same person still following you? If yes, then they are no doubt a spy. They had no reason to follow your full circular route and set off in your destination again except to spy on where you go and see what you do." It goes on to describe what items could be incriminating if found in a raid: "They will search your house for: weapons, cash (if you have a lot you will be asked where it came from), files /papers/computers which may contain terrorist information. Even anything written in Arabic or your child's small iPad will be taken and examined. You will be taken to custody and imprisoned for up to a month while they can look through the collected evidences for proof against you. Note: They will not break into your walls to look for things there, unless you have left big clues which make it look like you've put something there. Cageprisoners.com has sections on their website about what questions you have to answer, when you can say, 'no comment,' and what you can answer with a lawyer." Chapter 11: "Escaping For Safety"
This chapter lauds the fact that Muslims now have numerous places of refuge that they can seek out after committing a terrorist act. Some of the information contained in this chapter, including the map below, originally appeared in the e-book "Hijrah to the Islamic State," which was released earlier this year. This chapter explains: "Now that the Islamic State has been established in the Muslim world, believers can celebrate, because we are living in a unique time in history. Muslims can now do an act of terrorism and escape the country secretly and find places of refuge in the world... So if the Muslim finds it hard to flee to the Islamic State in Iraq and Syria through Turkey, he can escape to the Islamic State in Libya, or Khorasan (Waziristan in Pakistan), or in Nigeria (under Boko Haram territory.) Yes, it is difficult to reach them lands, but it is also difficult for the enemy to be confident enough to search for you there. If a Muslim is in them lands and is caught by non Muslims, he can say he is a freelance journalist, but if he is caught by Muslims- He can prove to them he is a Muslim searching to join the Mujahideen." The chapter then details how to reach the Islamic State even after confiscation of a passport: "If someone's passport has been confiscated by the authorities, then the person might try to escape the country secretly through other means. He may leave the country by bus to another neighboring country and then find a way to escape/smuggle himself to a safer land. Abu Rumaysah who was part of Shariah4UK did this in late 2014 – he escaped from the UK to France by bus (even though his passport was confiscated, there were fewer checks in buses.) From France, he found Muslim contacts who smuggle him to Sanliurfa (in Turkey) and from there into Syria's border. From there he was smuggled into Syria's city of al-Raqqah." Map showing Abu Rumaysah's escape route to Al-Raqqah, Syria. The chapter concludes with tips on how to contact mujahideen via Twitter, which is now targeting and removing pro-ISIS accounts. One tip is: "To find Twitter accounts of Mujahideen you can contact, go on Twitter.com/search and type :suspended share (meaning: their account has been suspended, please share the new one) – then look for the Islamic State members accounts." The book's final page is dedicated to useful resources: "Tor Browser, Twitter.com/search, Startpage.com (anonymous searches on Google), Temp-Mail.org (to use temporary email addresses for fake registrations i.e. on Twitter) Dispostable.com, Emkei.cz (send fake emails from any fake email address of your choice), Tumblr.com (make your own blog – they do not ban Jihadi blogs yet), archive.org (upload files with direct link downloads, 2shared.com, Scribd.com (share e-books)." Three paste websites are also listed: "(For sharing your articles online easily) Justpaste.it, Dump.to, Mdwn.me."